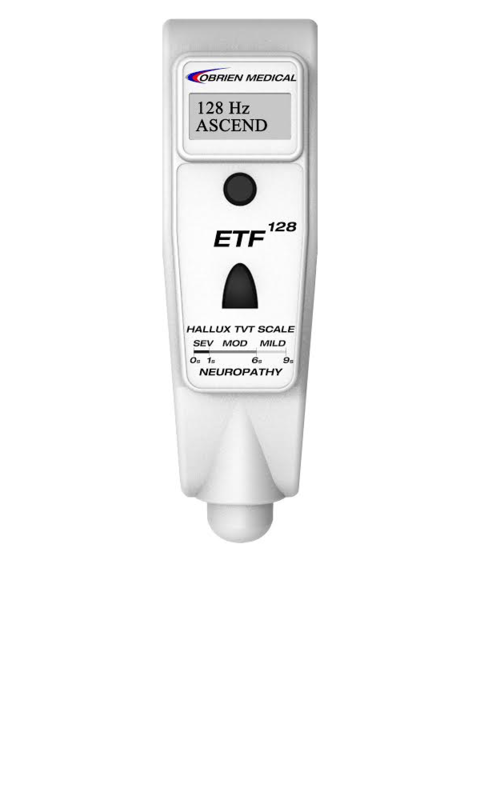 O’Brien Medical introduces the ETF128, an exciting new instrument for the neurodiagnostics market. The ETF128 is now commercially available after a five year development and testing process. Physicians have long known that 128 Hz tuning fork is the most sensitive of the commonly used neurological screening tests available in clinical practice. The ETF¹²⁸(Electronic Tuning Fork/128 Hz) builds on this foundation and takes it to the next level. The ETF does this by electronically reproducing the most valuable features of the traditional tuning fork. The improved accuracy and reproducibility afforded by this approach has been combined with an integrated timing function. The result is a modern medical instrument allowing physicians to diagnose diabetic peripheral neuropathy (DPN) at earlier stages. Prompt diagnosis of this condition is critical as neuropathy is known to be the key precursor leading to foot ulcers, infections and amputations. Armed with the ETF, physicians will be able to more rapidly implement preventative strategies aimed at reducing limb loss.